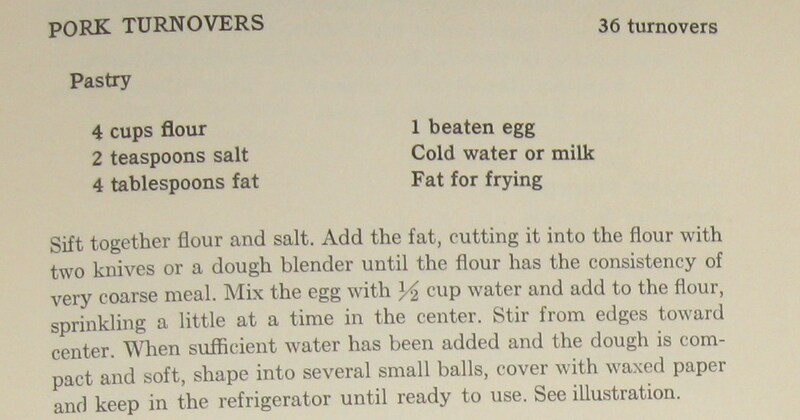 The authors state that the book was written in response to requests from American friends for a collection of recipes which would make the most of the ingredients available to them. 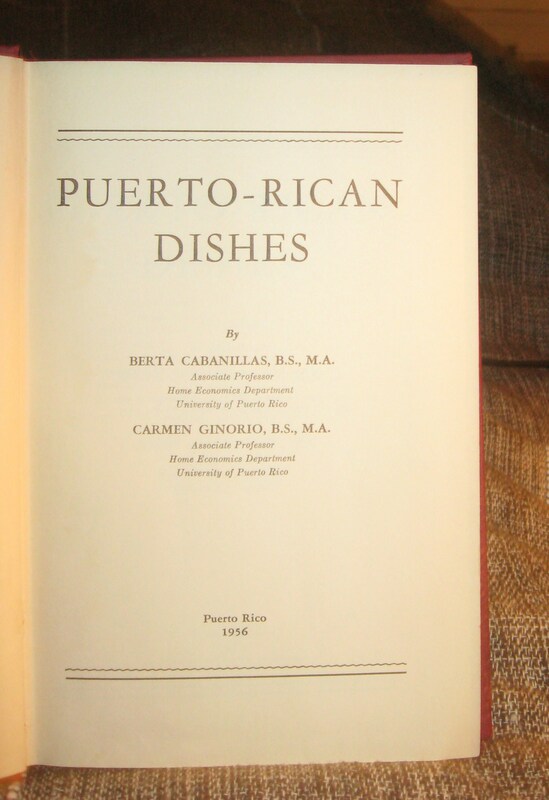 The introduction notes the various influences on Puerto Rican food, including the Borinquen Indians, Spanish colonizers and ‘even to the boats bringing slaves from Guinea and the Gold Coast, we are grateful for bringing us the yam and the banana’. There are recipes for all courses and foods groups, as well as suggested menus for one pot dishes, lent, Christmas Eve and New Year’s Day. Essential equipment for cooking Puerto Rican food is also given – I’m going to call my pestle and mortar, mi pilon y maceta from now on. and a tantalising list of fruit (will I ever have theopportunity to try the pomarrosa, the hevi, the sapodilla and the yellow mombin?). I made a quarter of the amount of pastry stated, but needed slightly more of the egg and water mixture to bind the pastry, I assume this is due to the lack of accuracy when measuring with cups. I used some of the rest of the egg/water mix to seal the pastelillos. This amount of pastry made 7 turnovers. 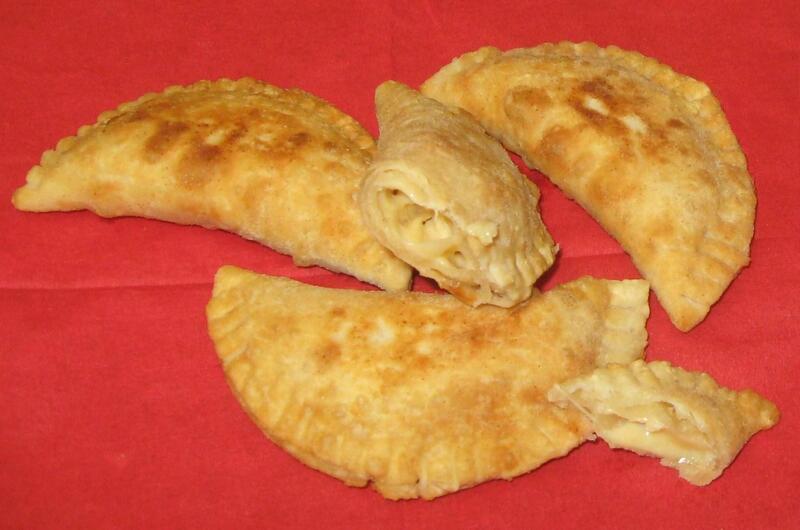 These were absolutely delicious – crisp, salty, flaky pastry covering melting cheese. I made a meal of them, having four with a stew of Swiss chard, tomatoes, peppers and onion from the same book. As the pastry doesn’t require resting and the amount of fat needed is fairly small as the pastries are so thin, these are ridiculously easy and quick and I look forward to an occasion to make them again soon. 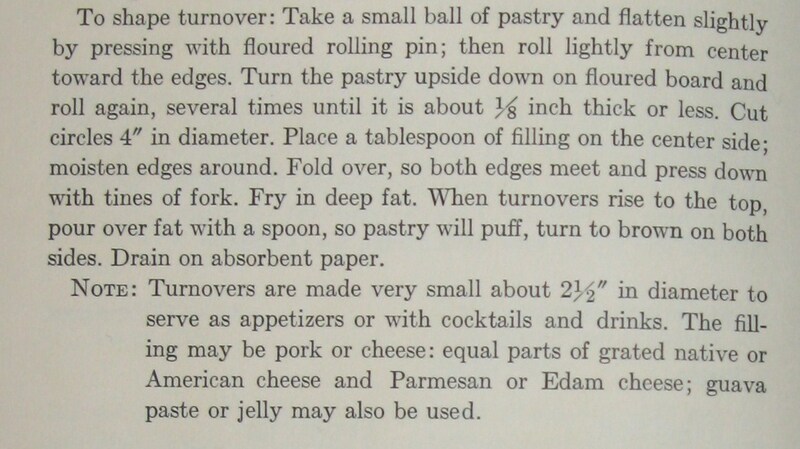 This entry was posted in 1950s, Berta Cabanillas and Carmen Ginorio, Puerto Rican dishes and tagged butter, edam, Parmesan, plain flour. Bookmark the permalink. Oh yum. FRIED STUFF WITH CHEESE. Thank you – even though it is a foolproof recipe, I confess I was very proud of these. Any other seasoning with the cheese – herbs, cayenne . . .? They sound superb. They’re often served with a bottle of hot sauce, a wedge of lemon or lime or fresh salsa, for added flavour. Of course, meat versions are more flavoursome in themselves, as the filling will usually include onions, garlic, chilli and olives, as well as minced beef, pork or chicken. I’m thinking new travel plans. Because I live in southern California I have been fortunate enough to have eaten sapodilla on several occasions, usually in the form of ice cream. So I say, get thee to Baja California and try it. You’ll love it. An excellent, versatile fruit.